(1) 谷口 , 他 , 追従自動走行を想定した車両空力の数値解析 , 自動車技術会春季大会 #20015268, 2001. (2) 鬼頭 , 他 , 車両床下流れの研究 , 自動車技術会春季大会 #20065159, 2006. (1) Cottet, G.H., et al. , A comparison of spectral and vortex methods in three-dimensional incompressible flows, J. Comp. Phys. 175, pp.702-712, 2002. Cottet, G.H., et al. , A comparison of spectral and vortex methods in three-dimensional incompressible flows, J. Comp. Phys. 175, pp.702-712, 2002. (4) 福田　紘大，亀本　喬司 , 渦法による乱流モデル構築に向けたラグランジュ型渦要素再配置モデルの提案 , 日本機械学会論文集 B 70-697, 2004. 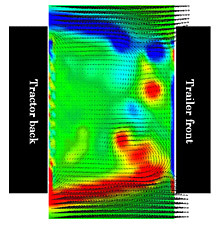 (5) Bernard, P. S., et al., Vortex Method Simulation of Ground Vehicle Aerodynamics, SAE World Congress, Detroit , MI , USA , 2005. 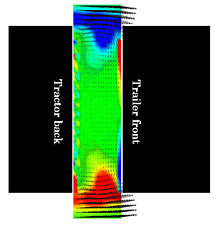 (6) Daeninck, G., et al., Simulation of Vehicle Aerodynamics Using a Vortex Element Method, United Engineering Foundation Conference on Aerodynamics of Heavy Vehicles, Trucks, Buses, and Trains, CA, USA, 2002. (7) Kamemoto, K., Ojima, A., Applicability of the Vortex Methods for Aerodynamics of Heavy Vehicles, United Engineering Foundation Conference on Aerodynamics of Heavy Vehicles, Trucks, Buses, and Trains, CA, USA, 2002. (8) McCallen R., et al., Working Group Meeting on Heavy Vehicle Aerodynamic Drag, UCRL-ID-135358, 1999. (9) Gutierrez WT, et al., Aerodynamics Overview of the Ground Transportation System (GTS) Project for Heavy Vehicle Drag Reduction. SAE 960906, pp.219-236, 1996.